Happy Monday! It was a pretty dreary weekend here so we kept things low key and were busy getting my mom up to speed with everything Sophia! Our routine is going to be changing once again since now Gary is headed back to work from his few months of paternity leave with Sophia! I'm planning on doing a few different posts including a day in the life and then a morning / night time routine, now that we actually have one! Sophia is going to be 5 months old on Wednesday and we've been holding pretty steady with a lot of our favorite things from months 2-3, but as she's developed so have her likes! These last few months you can really see her personality developing. She's starting to reach for things, become more interested in toys & getting better at rolling over - she still hasn't mastered the back to front roll yet! Baby Bjorn || We were lucky enough to have one of our neighbors loan us their Baby Bjorn bouncer when Sophia was 3 months old and it's been a life saver! It's so portable, light & the cover is washable. It folds up nicely so it doesn't take up a lot of space and I'm able to have her with me while I'm getting ready for work in the morning! She's just learning how to rock it herself and you can tell that she's really excited to do things herself! Smilo Pacifiers || The folks at Smilo sent a pack of three 0-3 month pacifiers over a few months ago and to be honest I was worried Sophia wouldn't take to them. All the other pacifiers that we had tried she was uninterested in or just didn't like. Within a few days of trying the Smilo brand, she took to them and was finally able to soothe herself to sleep in the carseat and stroller. The pacifiers are specially designed to support a baby's growing mouth. Paci Clips || If I realized anything from months 3-5, it's that babies love to spit their pacifiers out and then they get quite frustrated and upset that it's not within reach to soothe them right away. I purchased this adorable pack of 4 clips from Amazon. Sophie the Giraffe & Kiki the Elephant || I don't know what it is about these teethers, but babies seem to love them! These are both easy enough for their little hands to grab and easy on their gums! It's a winner and why it's on everyone's registry! V-Tech Musical Rhymes Book || I think this book keeps Sophia's attention longer than anything else. It's full of great primary colors, fun sounds and the pages are really big so she can attempt to turn them on her own. UppaBaby Ganoosh || This is as must for cold weather and wanting to be outside with a baby! This is basically windproof, insulated & is water repellant as well! The best is how easily it fits on the stroller and you don't have to remove it every time- once it's on there, you're good to go for the entire winter. The zipper allows you to keep it open if the weather isn't as cold. Milkmakers Cookies || Thanks to my friend Rachel for introducing me to this brand! I basically get to eat cookies and it helps keep my supply of milk going. Variety of flavors and they are all individually packed so they wont go stale. Daily Kiddo App || We've been using the Daily Kiddo app since Sophia was born to share photos and videos with family. I love that you can view it on the phone or via the website and can make a book right from the app! I don't share every moment on social media and it's nice that our family from all over is able to keep up with Sophia's milestones via this app. Baby Sensory videos || When we're in the car and there is an epic meltdown happening, our last resort are baby sensory videos on Youtube. I'll let her focus on it for about 2-3 minutes to calm down and then she usually falls right to sleep. Over the next month or so we'll be attempting sleep training. If you have any tips on how you were successful to get your baby to put themselves to sleep at night, that would be great! I can't believe Sophia is going to be 5 months this week. Where has the time gone?! I have heard that the obsession is real when it comes to Sophie the Giraffe -- I bought my best friend's baby one and he loved it too! Hope you had a great holiday, Biana! Such cute picks. It's been a while, but my son LOVED his bouncer. It was definitely his happy place. That's so funny--one of my best friends' baby LOVES that exact giraffe teether! Time seriously flies. How is it already 5 months?! Baby stuff will always be the cutest! I cant believe shes already 5 months! who doesn't love Sophie the giraffe? looks like a great list. also good luck on the sleep training! you guys got this! The Baby Bjorn Babysitter is the best seat ever! I highly recommend the toy bar that goes on it! Riley still plays with hers (even though she can't sit in the seat anymore) And I love Kiki! She is just so cute! 5 months already?! Time flies!! Wow, 5 months already!! Time is moving too fast. She is such a little cutie. I bought Sophie for my friend's daughter and she loved it. In fact, she loved it so much, I got a back up of it. Lol. She is five now but still has it, it lives in her doll basket with her other dolls. She still loves it. I cannot believe she is 5 months already, that flew by! That is great that he got paternity leave. All of my nieces loved that Sophie the Giraffe! I am so glad your parents are finally there! I have heard those teethers amazing! I just went to a baby shower yesterday and she got the BB bouncer. I told her she will love it. Happy Monday sweetness! Sophie is the best! Olivia loved her so much! She still carries her around to this day sometimes! I tried to put it away and she wasn't having it, so Sophie will live on in our house for a while longer! 5 months already! My eldest used to love that musical rhyme book..
My girl still loves her Sophie! idk What it is about that thing, but it puts a smile on her face and she grabs it form me!L OL! Zoe still has her Sofie. She doesn’t really chew in it anymore, but likes to squeak it from time to time and lets her baby dolls “teeth” with it. I cannot believe she is already 5 months old???!!!! How is that possible? My little ones loved the Sophie giraffe too! :) We had such a mixed experience with sleep with my two boys! My eldest puts himself to sleep pretty well, but we were still sitting and shooshing and patting the baby to sleep when he was a year old, haha! Of course now he can put himself to bed, it doesn't last long! Feels long at the time though! I love Sophie the giraffe! I've got the cutest footed pajamas with that print! 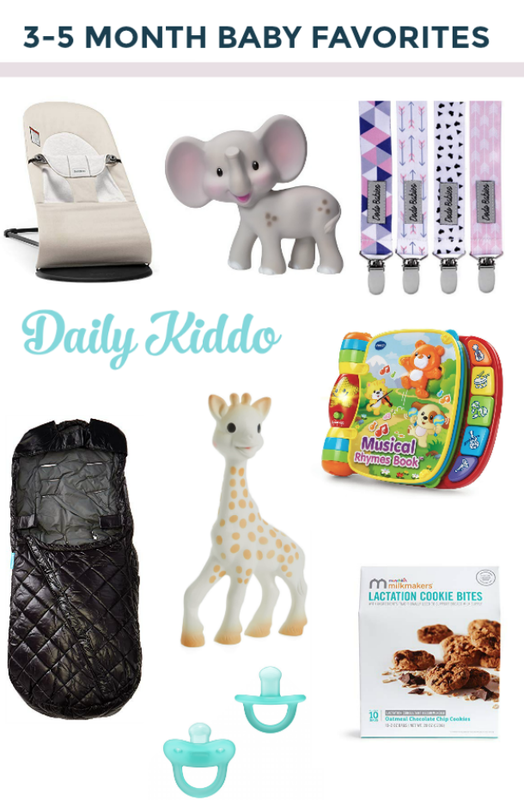 Uppababy has the best accessories! Spencer LOVED his Sophie La Giraffe for almost 6 months straight - never wanted to put it down! We were big fans. Also, I love that you mentioned the lactation cookies...I used to make them, but it was so time-consuming. I love that you can buy them single-serving now. I'll have to look into those when baby time comes! The Baby Bjorn Bouncer was by far one of our favorite items! The portability was KEY! I have heard the Bjorn is an absolute life-saver! These are great for babies. My daughter loved this musical book. Ill have to save this post for when I get pregnant to prepare for baby to come! I'm sure your mom is going to love her time with Sophia! These are great ideas for presents for my mama friends!